School Hours: 8:05 a.m. - 3:05 p.m.
Assistant Principals: Mr. Reid Saeler, Mr. Thackston Sebera, and Mr. Larry Cherry, Jr. According to available records, a high school was first established in Hopewell in 1915. The enrollment that year was reported as twenty-one pupils with four teachers. It is not clear where this school was located, but during that year or the following it operated in the old "B" Village School . During the 1921-22 school year, Hopewell High School was housed in the YMCA Building on 3 ½ Street. In 1924, construction began on the building presently known as the James E. Mallonee School . It was completed in 1925. During the Thanksgiving holidays in 1925, the high school was moved into the new building. Total enrollment was approximately 600, including parts of the 5th and 6th grades. Ten high school teachers were employed for the 278 students in grades 8-11. During the next few years, the elementary grades were gradually transferred to other schools as the high school enrollment increased. Hopewell High School's present facility located on Mesa Drive was opened for the 1967-68 School year and the interior covers 7 ½ acres. This facility was altered by an addition to the library, almost doubling it size, and the completion of a second vocational wing, during the 1985-86 school year. Early in its history, Hopewell High School was planned as a comprehensive high school with offerings as varied as the demand and facilities would permit. Home economics and business courses were offered before 1923. Classes in industrial arts were started in 1935. In 1938, a full-time music teacher was added to the staff. With the completion of the present high school building, additional academic and vocational courses have been included in the curriculum. 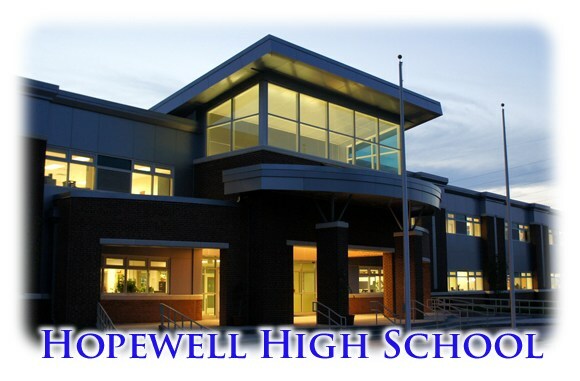 Hopewell High School has always conducted a well-balanced physical education, health and athletic program. Interscholastic schedules have been played in football, basketball, and baseball since 1923, track since 1936, and golf since 1954. The girls have played inter-scholastic basketball since 1923, softball since 1935, and field hockey since 1946. In more recent years athletic programs in wrestling, golf, cross-country, indoor track, soccer, and tennis have been added. Hopewell High School was state champion in basketball in 1972 and state football champion in 1949, 1950, 1951, and 2003. Hopewell High School features a full activities program. The school has been a member of the Virginia High School League since it organization. The debating team won the State Championship in 1923. The Student Government Association was established in the Spring of 1928. The National Honor Society was begun in 1945. Honor societies in foreign language and music were implemented in 1999 and 2000, respectively. The publications of Hopewell High School apparently began with the annual published by the Class of 1925, under the name of the "Satellite". That fall, a monthly paper called "The Kaleidoscope" began publication. About 1930 an annual in book form was issued under the name "Kaleidoscope". This became the established name of the school annual, which has been published every year since that date. Starting in 1985-86 a school newspaper has been published periodically. The Literary Magazine, "The Paragon" began publication in 2000. Another phase of the history of Hopewell High School defies identification as to dates and physical features. It can be called school spirit. This spirit is characterized by a loyalty on the part of students and alumni to the school, its teachers, and its program of activities. It has become a cherished tradition that has been handed down to us. We should make every effort to preserve it.